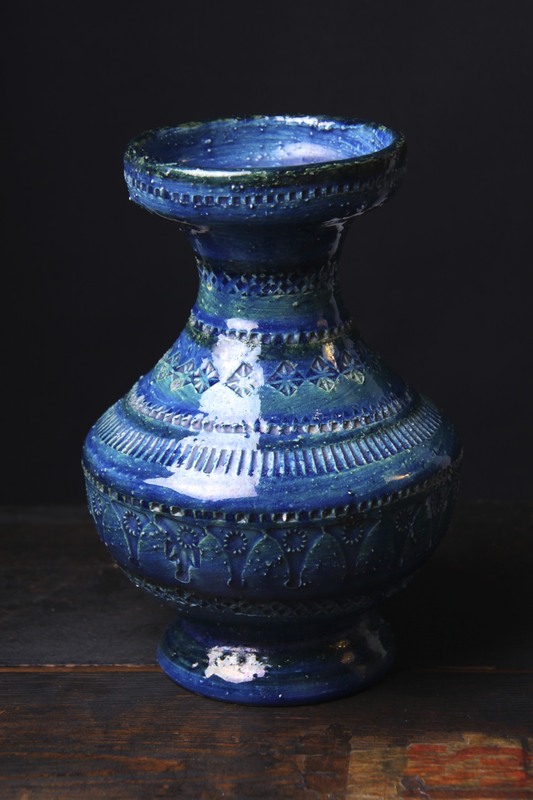 This is a Beautiful Bitossi Ceramic ‘Rimini Blu’ vase, Italy circa early 1960’s. A Great Unusual design, the baluster / urn shape, with a bulbous body and squared flared rim, is inspired by ancient Mediterranean pottery. Made of clay with crushed granules to give a rough texture, the texture and glazes indicate this is an earlier example. A Fabulous piece designed by Aldo Londi, in the iconic ‘Rimini Blu’ glaze with blue and turquoise glazes resembling the Mediterranean Sea. With its alternating bands of impressed motifs resembling Arabesque or Runic patterns, it is influenced by the new trends in art and design in the mid century period. would make a Fantastic practical vase or display piece, and would look great in any 50’s, 60’s, retro, vintage, mid century modern, modernist, minimal or contemporary interior. A Great addition to any collection of Bitossi / Italian / European art pottery or 20th century design. 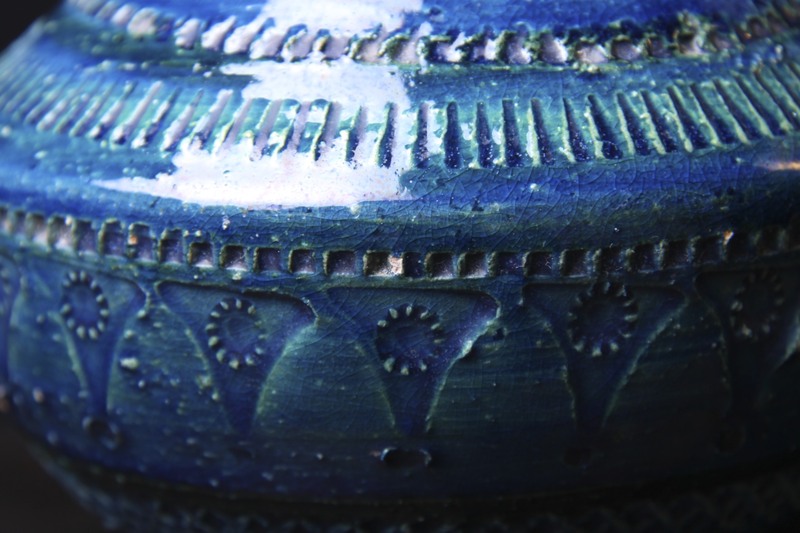 In Great Condition, a chip to the glaze on the rim and a few very small flakes of missing glaze on the impressed motifs, common with the textured form and glaze on these pieces. Nothing to detract. Not marked to the base, as is common with these pieces. Many just had the exporters / retailers paper labels. Measures 20 x 14 x 14cm / 8 x 5.5 x 5.5in.